Orthodontic treatment (orthodontics) involves the straightening of crooked teeth. Crooked or overcrowded teeth can look unattractive and can lead to problems because of the way the teeth bite together. This can put a strain on muscles and cause headaches and jaw pain. Teeth that are correctly positioned also help to maintain better oral health by providing more space to clean the areas in between each tooth. 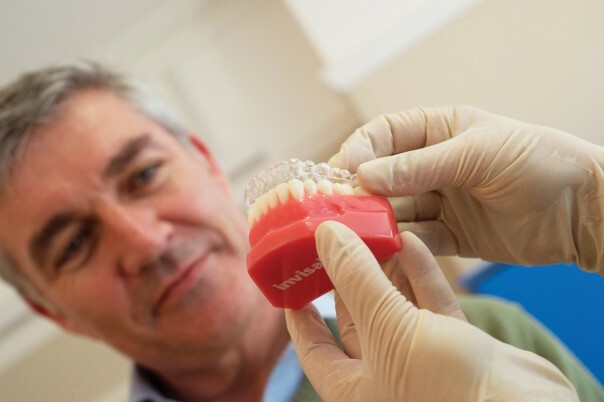 Whilst orthodontic treatment can be carried out by general dentists, many prefer to refer this particular field of dentistry to a specialist who has more experience and skill in treating patients for overcrowding or problems with the formation of the jaw. Orthodontic treatment is often associated with children. However, treatment can also be provided to adults. Many adults assume they have to tolerate overcrowded or misaligned teeth if they did not receive treatment as children. The development of invisible brace systems means that treatment can be provided discreetly without causing difficulties in professional or social circumstances. advise what extent of treatment is required to correct the alignment of your teeth and the treatment options and costs. Removable appliances are made of delicate wires and springs, which move the teeth using gentle pressure and may be taken out of the mouth for cleaning. Fixed appliances have brackets and bands which are temporarily fixed to the teeth. A flexible wire joins all the brackets and allows the teeth to be moved. Fixed appliances are designed to remain in position until treatment is complete. Clear aligners are tough, clear plastic moulds which are almost invisible. Several sets of specially moulded, slightly different aligners are made for each patient. Each set is worn for two weeks before being replaced with the next one. Because they are invisible no one need know you are straightening your teeth. Some patients experience a small amount of discomfort from the braces, particularly whilst they are becoming accustomed to them, but generally orthodontic treatment is painless. You will be encouraged to take particular care with your oral health care during treatment and may be asked to attend the dental hygienist who will assist in maintaining your teeth and gums whilst you are receiving orthodontic treatment. The length of treatment varies depending upon how much movement is required to achieve the correct alignment. Following the completion of your treatment you will be provided with a fixed or removable retainer to ensure your teeth are gently held in their newly aligned position. The cost of your orthodontic care will be fully discussed with you during the consultation appointment and is determined by the level of treatment required and which system is used.